My blog hasn’t been updated in a while and that’s because I’ve been busy. Busy like always but even busier than that. A little over 2 weeks ago, I decided to open the doors on a pet project that I call AutCraft and I’ve done very little of anything else since. Minecraft has proven very beneficial for people with autism as it provides the open world, no stress, creative and imaginative sandbox space that they can thrive in. Do as much or as little as you want. Explore, adventure, fight monsters, fight each other, do technical work, build magnificent buildings… it’s entirely up to you. The one area that it’s struggled, however, is in it’s social game play. Minecraft servers are everywhere but they’re largely left free. That is to say, they let players do as they please. And rightly so really, considering Minecraft is a sandbox, a free to do as you please type of game. But that environment isn’t great for those that may struggle socially. This is where I thought I could help. I created a server where bullies are not tolerated and monsters are kept at a distance so as to not scare the younger ones and player vs player damage is turned off. More so than that, each player gets their houses/bases/stores/etc protected so that no one can build, break or take anything within that zone except for the person that owns it. The main thing? It’s a white list server which means that only those people that I approve can access it. It’s not open to just anyone. In the first 2 days, I received over 700 emails. Within 2 weeks, I had 500 players on the list. I had upgraded the server from package #1 to package #8 in it’s first 8 days. I found 3 blog posts about it and the fan page had gained 700 likes with a ton of praise and approval from parents. On the first night, after I put my boys to bed, I sat down to 126 unread emails, replied to 82 of them and still had 94 unread emails left. Good thing I started small right? I don’t mean to inundate you with our gratitude, but I had to share this: Today, we sat in the waiting room for speech therapy. When it ended, my son, my daughter, and a friend’s son (who recently joined Autcraft) had the most passionate extended conversation. All about Autcraft. They talked, listened, asked questions, and offered advice. No one who didn’t know them would have ever guessed that these kids had any social skill problems. The SLPs looked on fondly. They smiled, no doubt thinking that all their hard work and therapy was paying off. What they don’t know about is all the hard work that YOU have put in that made this awesome conversation possible. And there are plans for a Minecraft play date soon. Thank you for giving these kids something to talk about and bond over, somewhere to belong and be accepted, and a pastime that has provided hours of entertainment, and even some learning. I really appreciate it. I wanted to say, my son is loving Autcraft. Another child gave him gifts today and he was shocked. A little while later he said to me, “I didn’t really want to, but I gave some gifts away to others. It makes me want to give things to people.” It is a new thing for him to want to share. He also has spent a lot of time on it exploring and building. Thank you so much for this experience. My son just got invited and went on and immediately introduced himself with his real name. He happily explored before school and was thrilled that “a new friend” gave him diamonds to get started. I’m so grateful you made this safe place for them. Thank you so much! I like that my son is not worried about being “Cool”. He gets very excited about the things he likes, and doesn’t feel self-conscious when trying to talk to other people about them. To me, THAT’S Cool. I hope you’re able to get sponsors to continue to grow. The Autism community needs this. I’m already seeing improvement with my kids social skills, reading and typing. So where have I been if not updating my blog lately? Well, mostly work… sadly. I still have my 9-5 job but now I also try to be on the AutCraft server as much as I can to be with these great kids and families. They’re doing such great work and learning so much and building so fast. I hate missing a single minute of it. Right now, I’m looking for sponsors/supports that are willing to pick this up and back it financially. I’d be proud to put “AutCraft sponsored by” or “brought to you by” and then a charity’s or company’s name after if it means that I can be in game where I’m needed most. They do so great without me but even better when I’m there. We go on adventures, I take them out to find places to build… we just have so much fun. 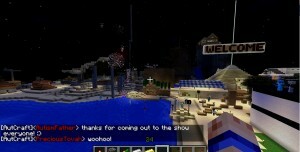 So if you get a chance, check out http://www.autcraft.com and see what I’ve been up to! This is Tyler. We shared an employer many moons ago, maybe you remember me? I randomly stumbled upon this blog, because I too play MineCraft on occasion. I want to say, I thoroughly enjoyed reading some of your blog entries and I admire all that you’re doing. I hope you don’t mind, but I submitted your page to Reddit to get Autcraft and your blog even more exposure. I hope all is well, with you and your family. It’s truly appreciated. Thank you very much. I adore that the planet of minecraft is actually randomly generated when you load the game for first time. You must then survive on this planet by collecting wooden, building tools along with fighting monsters. I must say that this can be the best game ever before! Thanks for this particular great post male! I like information on the minecraft lets hope that this game will get more popular and there will be some more variations.